Ever since John Green's An Abundance of Katherines I have developed a mighty love for road trip books. There is just something about a summertime read that creates a feeling of wanderlust in me. Getting lost on the backroads of some lonely highway is so appealing. I read this at the beginning of the summer, which was perfect timing as I was about to head out on a road trip of my own. 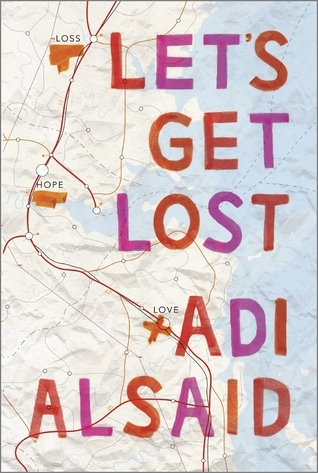 Let's Get Lost is divided up into sections, with each section telling the story of a different person. It felt a bit like a set of novellas tied together by this mysterious wanderer named Leila. At first, I was worried this would turn into some story of a manic pixie dream girl changing people that she meets on her travels. This is definitely not the case. While Leila ties all the stories together, it is more a novel that highlights the beautiful individualism in people. Everyone is complicated. No story is simple, and that is what I love about travel stories. You get to meet these complex and beautiful characters that not only change the way you see the world, but the way you see yourself. When the story begins, the reader goes not know much about the character of Leila. Enigmatic and quirky, she is easily someone I would love to road trip with. Yet while she meets characters and helps them see their true potential, the reader begins to see the true potential in Leila. This story is also so richly American. I mean this in a good way. It reminds me of the good things about this country. The diversity and individualism that make up such a beautiful pattern of people and cities. This is something that we can so quickly forget, and I enjoyed that Alsaid highlights this in his storytelling. This story was just so charming, I couldn't help but be a smitten kitten. If you are looking for a fun summer read, then definitely check this out.